Specially created with the discerning business and leisure traveler in mind, Taj Palace Hotel Dubai offers 159 executive rooms and suites, the largest rooms in the city measuring 61 square meters in area, all comes with balcony. It has 90 serviced apartments, an exclusive The Taj Club Dubai Executive floor, 5 multi-cuisine restaurants namely Handi (Indian), Sakura (Japanese), Verdi (Italian) and Topkapi (Turkish-Arabic), a Health Club, 2 rooftop pools and an Taj Ayurvedic Spa offering rejuvenative massages that nurture the mind, body and soul. To cater to the corporate business, 3 meeting rooms called Taj Platinum, Taj Gold, and Taj Silver plus the Al Khaimah ballroom were specially built with state-of-the-art audio-video equipments. Guests also enjoy beach access and a daily shuttle transfer to the citys major shopping malls. The hotel does not serve alcohol. 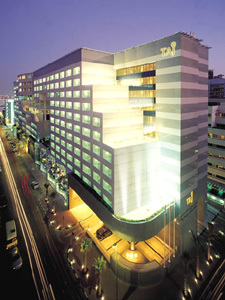 A year after it opened in 2001, it was nominated as Dubais Best New Hotel. In 2004, Handi, the Indian restaurant was awarded UAEs Best Indian Restaurant. The Taj Palace Hotel Dubai is managed by the Taj Group of Hotels and Resorts under the Taj International Luxury Hotels brand. The Taj Palace Hotel Dubai's executive rooms are the largest in the city measuring 51 square meters for room space plus 10 square meters for balcony area totaling 61 square meters with delightful furnishings, parquet flooring, paintings and superior room amenities, all with balconies and ensuite facilities. Each room creates a most comfortable and luxurious atmosphere and has a private balcony of its own.